In a decade, we have easily been gotten and heard the news about "hacking", "virus" and "DDoS" frequently. With a booming of internet and networking, there is no difficulty to know what happened opposite side of the globe even in apogee and backwoods. Because we can use internet so that only several clicking are just needed to find those. That is, the time barrier has been demolished and internet usable PC are prevalent all over the world. Every packet(unit of data in computer) is containing various kind of information, then various type of information are categorized according to its importance, such as important, unimportant, to be confidential or to be verified from writer and so on. For this reason, someone has a duty keeping and protecting that information, while others are trying to steal, tamper or even destroy like a real-world. After the installaion, click the “Advanced mode” above. - Security Center : Shows current security setting status, and helps to modify settings about update and product information. 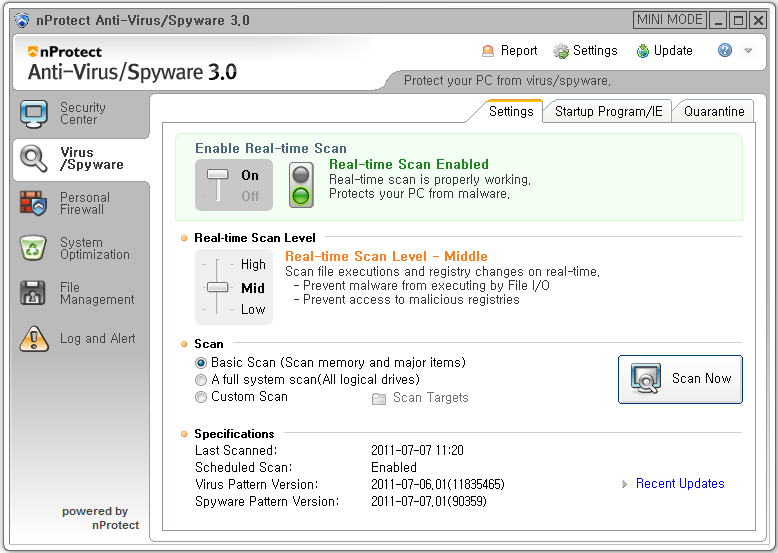 - Virus / Spywayre : Can scan system with real-time scanning function, core of nProtect AVS 3.0. - File Management : Protects important files with encrypted and removes file to be removed. What are you going to do after installation? 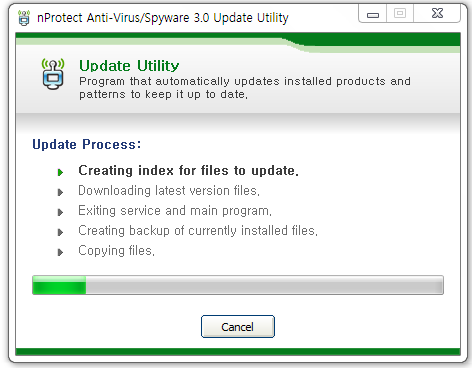 The most important thing of anti-virus program is update, maintaining the latest version. Without latest version and updating pattern, AV program is useless. We recommend you update at least once a day. So we want to let you know 2 ways of updates as following. 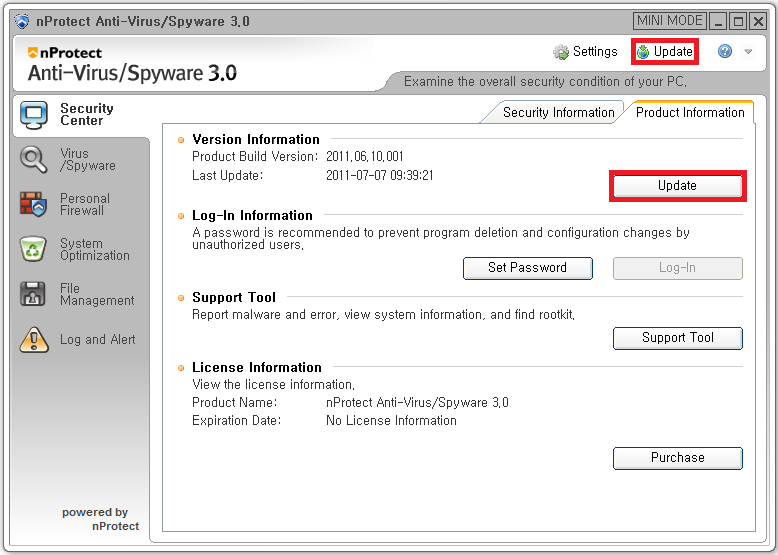 Our update menus are located in upper part of main menu and Security Center – Product Information. 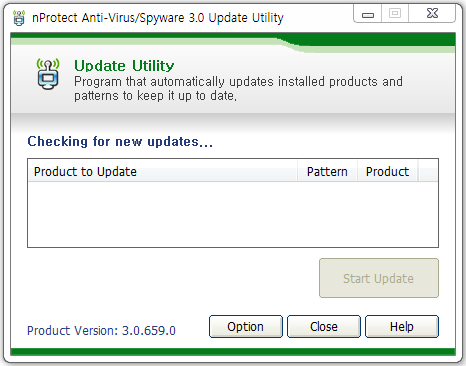 Clicking one of those update button will show nProtect AVS 3.0 Update Utility window as following. 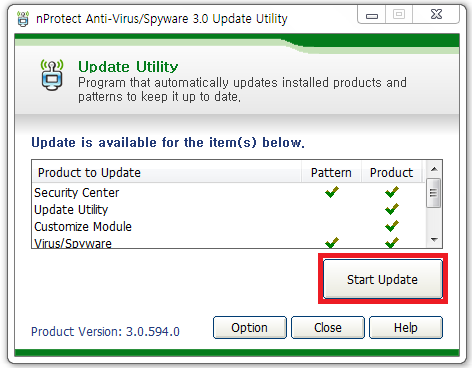 After checking updatable pattern and product automatically, click “Start Update”. It will update in case of having updatable contents. 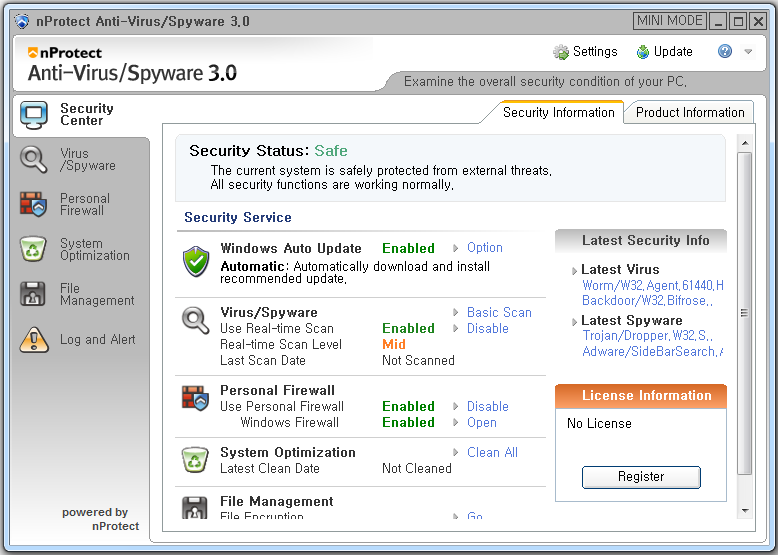 Then you can check the status of latest version from Virus/Spyware – Settings – Specifications – Virus Pattern Version such as following figure. However, this kind of manual update is bothersome and needs manual labor, so that we recommend you update automatically. Before preparing to set, we set it as default. Following figure will let you know setting 'Automatic Update' and changing default policy. 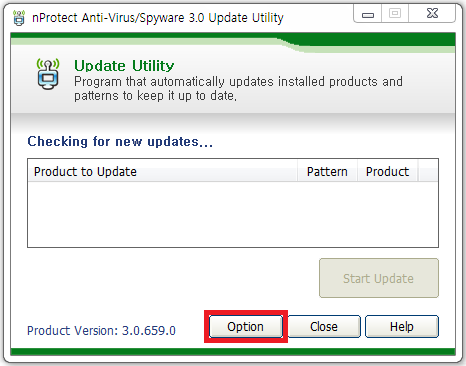 Click "Option", in "Update Utility". 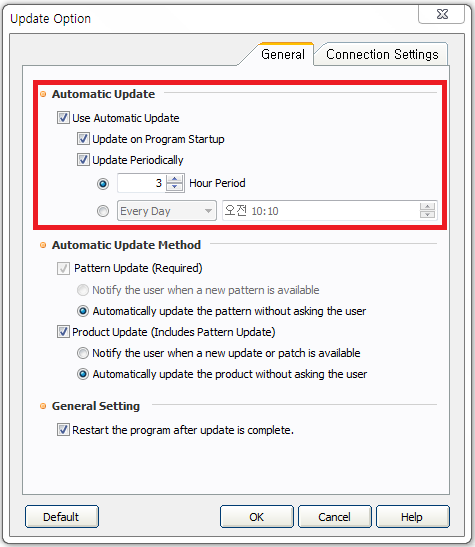 You can decide "Use Automatic Update" and set period by certain hours or manually. Remove malicious program with “Scan”! 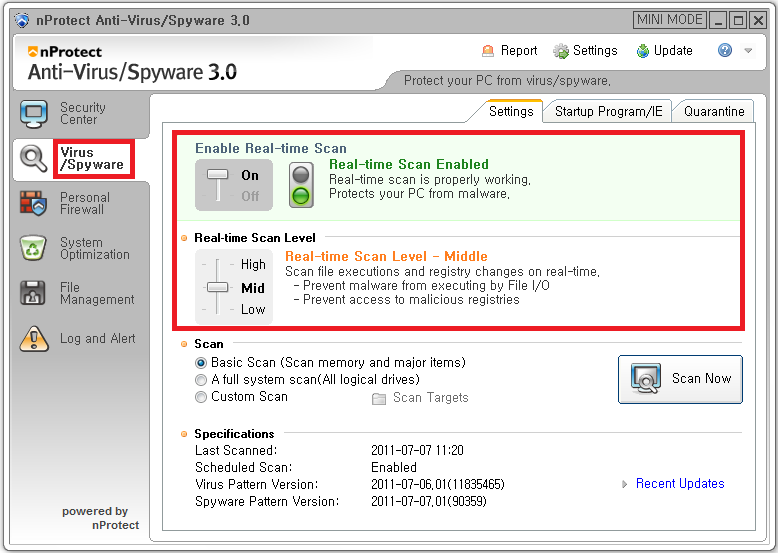 You can perform “Scan” in "Virus/Spyware" tab. There are three types of scanning, “Basic Scan”, “A Full system scan”, “Custom Scan”. “A Full system scan” will scan whole parts of your PC as its name is. It will need a pretty long time though, after the very first installation, you have to find malicious things every inch of your PC at least one time, isn’t it? Check “A full system scan” and then click “Scan Now”. 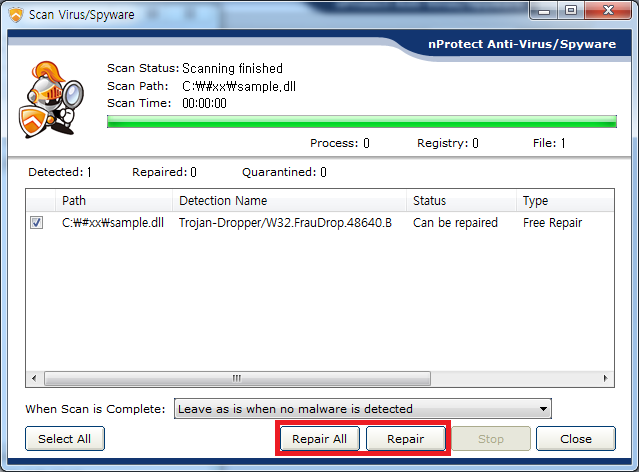 nProtect AVS 3.0’s DUAL engine is scanning using process, registry, files. 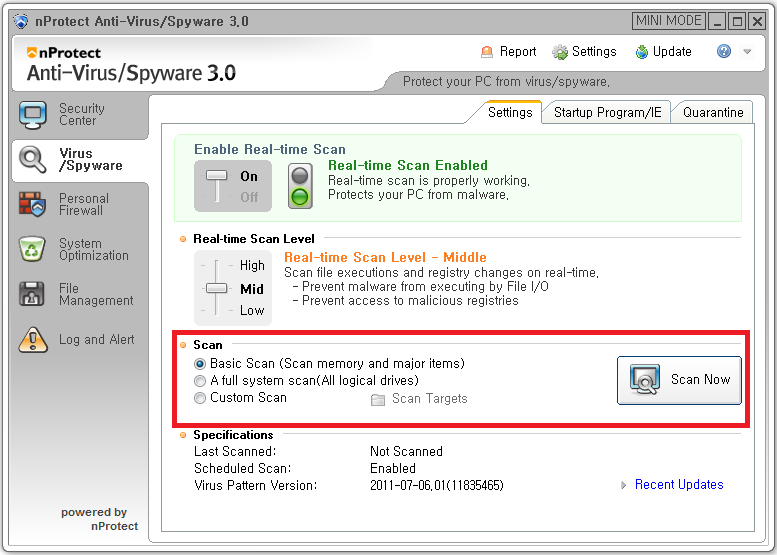 When the scan is complete, the path of various malicious programs being scanned can be found in detail. OMG! It detected Trojan horses in my computer. Before being leaked my precious information, we have to remove it. Click the “Repair All” or “Repair” after checked. That file has been removed, but some programs need to reboot depending on its type of malicious program, checking the “Status” menu is essential. We walked a long way. Likewise “Basic Scan” and “Custom Scan” adopted same way to scan. 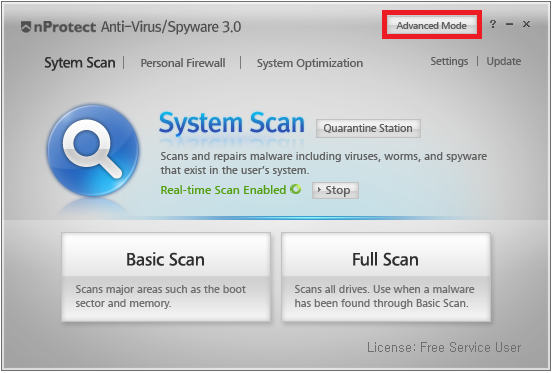 “Basic Scan” is scanning System memory and Windows system file only, because having infected Windows system file is critical, this type of scanning is quick and widely used. “Custom Scan” is that user can choose suspicious folders. Now you can trust that your PC is safe from threats though, don’t be loose of your PC. It can be infected at off your guard. For the most, the best way to avoid from malicious things is maintaining AVS up to date. You can use real-time scan with turning “Real-time Scan” menu on. “Real-time Scan” has its own level. The higher level, it scans more restrict. But in case of low performance PC, its system speed can be slower. This below figure shows warning page, with enabling Real-time Scan function. It needs performance but can give you a big help unexpectedly. So far, we walked along from “Update”, “System Scan”, “Real-time Scan”. As we studied above, To draw up maximum performance on anti-virus program, it needs to be customized depending on user’s computer, updates and lets be maintained up to date. The more elaborate techniques to bother increased for malignant behaving user, the sophisticated prevention techniques has been developed. We have already known a lot of accidents on the internet and are struggling against those kinds of criminals. That is our work and main purpose. 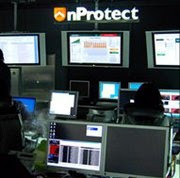 So we suggest our elaborated and well detectable anti-virus software nProtect Anti-Virus/Spyware 3.0 as known as “AVS” (also known as GameGuardPersonal 3.0) in some place and about to introduce one of our masterpieces. lực linh hồn chi đạo cường giả làm?" Này một người, còn không có nói xong, đó là bị mặt khác một người cắt đứt, đạo "Nếu là tu luyện linh hồn lực nhân công kích chuyện, như vậy thế tất hiện trường lại lưu lại lượng lớn linh hồn một cơn lốc, còn có chính là, nếu là tu luyện linh hồn lực nhân công kích chuyện, như vậy hắn trên người cũng nhất định có đấu khí ba động, không có khả năng không có chút nào đấu khí ba động." Người này chuyện âm vừa mới hạ xuống, tựu dẫn tới trong phòng mọi người đều tán thành. Sở dĩ nói, lúc này đây tập kích ta Lâm Gia nhân sẽ không là tu luyện linh hồn lực nhân, còn nữa, có thể có lá gan đối phó chúng ta là ba chín Tinh Đấu đế nhân, linh hồn lực tu vi phải phải là Thánh cảnh đỉnh cường giả, linh hồn lực như vậy cường đại, tại Viễn Cổ Đại Lục lên không có khả năng là bừa bãi vô danh hạng người, hơn nữa, ngày hôm qua ban đêm, vây công chúng ta thì có ba người, ta nghĩ biết, ta Lâm Gia địch nhân có người có như vậy thực lực, có thể thỉnh đạt được ba tu luyện đến Thánh cảnh đỉnh chế thuốc Đại tông sư! Mobistealth is the application that works with all types of mobile devices and computers. Only one program can fill the needs of all customer types, have a glimpse at spy app mobistealth here to find more. Thank you for bringing more information.. Download best games for PC. Have a trouble with your academic papers? Examine this blog and you will have no problems at all.